7 Ecwid vs WooCommerce Things You Need to Know​! Finding the right eCommerce solution is not easy. WooCommerce is a very well known WordPress eCommerce plugin. But Ecwid which isn’t as well know, may be a MUCH more adapted eCommerce solution for your needs. So should you choose Ecwid or WooCommerce? I have found that when you are comparing Ecwid vs WooCommerce, Ecwid is a better choice if you own a small or medium-sized business and if you have no coding experience. If you do not want to count on an agency or developper to update your site, Ecwid is a better choice. This whole blog is about Ecwid eCommerce I love it and use it every day. It is the best eCommerce solution for SMB’s, freelancers, influencers and anyone who wants to sell online quickly and easily. Try Ecwid for free. Turn WordPress into a drag-and-drop builder. Elementor makes it easy to build a beautiful website quickly. It is the best WordPress builder in my opinion. This page was built with Elementor! SiteGround is the best website hosting service I have tested, period. And I have tried many. What makes them stand out is their support and their low prices. I love their service. I have tried tons of domain services and none of them compare to NameCheap. The platform is ultra user-friendly and they offer stellar support. Prices are very low and WhoIs Guard is included, for free. WooCommerce is a plugin built to transform WordPress sites into eCommerce platforms. It is an excellent open-source eCommerce tool developers can customize and tailor to their customer’s needs. WooCommerce can be a very powerful plugin to build an eCommerce site, if you know how to code. Ecwid stands for “eCommerce Widget” and is an omnichannel eCommerce plugin. It was built with high quality user experience in mind as a selling tool for small and medium-sized business owners and marketers with no programming knowledge. 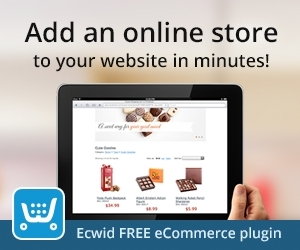 Ecwid seamlessly integrates WordPress allowing anyone to create an online store in a couple minutes. Both WooCommerce and Ecwid can be installed as plugins on hosted WordPress sites for WordPress eCommerce. However, you may not be a programmer. In which case you may be experiencing frustrations due to WooCommerce crashes or updates. Ecwid’s number one greatest strength is its user-centric design. Ecwid’s interface is very easy to learn and demands no backend maintenance for the store owner. After creating an account by entering your email and password, you will be brought into your new Seller Control Panel. The interface is intuitive and very comprehensive for non-technical users who have never before sold online. Hassle-free setup on a hosted platform also drastically reduces the need for a developer. This means you will not have to purchase extra hosting if you decide to add your Ecwid store to your WordPress site. There is no need for manual updates as the software is constantly and seamlessly updated by Ecwid’s team, reducing security risks related to your eCommerce. Thanks to constant development and improvements, a great pleasure you may discover is opening your Seller Control Panel one morning and finding that Ecwid has new features. Unless you have a reliable developer working on your site for you, WooCommerce may be a frustrating solution to manage and maintain. With over 1M users and a constantly developed product since 2009, Ecwid offers a complete eCommerce solution that is user-friendly, is very easy to learn and fully supported by their team. You never have to carry out manual updates reducing the need for a developper. If you are searching for online independence and autonomy, you may want to look into Ecwid. It can accept over 50 payment methods including PayPal, Stripe and WePay. The seller Control Panel where you manage your inventory and sales translates into 21 languages including French, German, Italian, Spanish, Turkish and Japanese. Default Ecwid texts automatically translate into over 50 languages in the storefront depending on your customer’s default browser language settings. Ecwid also automatically manages taxes depending on your customers postal code (this feature is included in paid plans). You can also sell and automatically send e-goods such as eBooks, music and files (included in paid plans). Each of these integrated features and automations save a large amount of time and development requirements. Ecwid offers stellar user experience. If you have no technical development skills or don’t know how to code, you will love working with Ecwid. It’s very simple and intuitive. 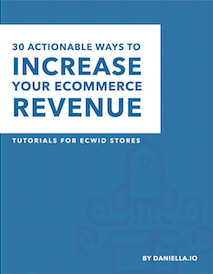 Ecwid’s setup guide will help you through the process of setting up your store. WooCommerce is more adapted to developers or people with more technical backgrounds. Give Ecwid a try for free, no credit card required. If you would like to learn how to create a professional online store in one day, click here. 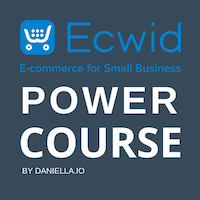 Ecwid eCommerce Power Course that provides 60 up to date videos on how to setup Ecwid and get sales starting day one! Both Ecwid and WooCommerce are omnichannel platforms, meaning that they allow you to sell on multiple platforms at the same time. For example, you can synch your store to your WordPress site, but also to your Facebook Business Page, your Instagram Business page, your Amazon account, and your eBay account among others. These integrations allow you to sell in multiple places at the same time while managing everything from one dashboard, so you can reach more customers and make more sales. It is the ease at which these integrations can be carried out that stands Ecwid apart from WooCommerce for non-technical users. The following sections will demonstrate a couple platforms that Ecwid integrates with, some of which WooCommerce also integrates, but much more seamlessly. Facebook has over 2.2 billion monthly active users and millions of likes on business pages have created strong vanity metrics. Few business owners actually know how many of their “page likes” are converting into actual sales. Most businesses focus on the number of interactions more than on actual conversion to sales. Ecwid’s Facebook integration allows you to add a tab to your Facebook page where your customers can consult your products within Facebook, and be sent to your site to purchase them. This integration is managed right within the Ecwid seller Control Pannel so there is no need to install plugins. The integration also allows you to tag products in photos and to notify customers of new products in your Ecwid store if they subscribe to your store. This is an excellent opportunity to notify your customers of new products automatically, right within their favourite social media platform, bringing them directly to your products for sale. According to Ecwid, Ecwid merchants see an average 15% revenue increase with the addition of a Facebook store to their Facebook page. Instagram Shopping is currently available in over 30 countries and allows you to tag products in photos and stories in Instagram. Customers can click on the link and be directed to your online store to purchase the item or browse your online store. Projected to surpass over 111M monthly active users in 2019, 80% of Instagram users follow at least one business page. This integration is managed right within the Ecwid seller Control Pannel so there is no need to install plugins. You simply need to have a Facebook store activated (this is also managed in the seller Control Panel). Ecwid and WooCommerce seamlessly integrate with Amazon and eBay thanks to Codisto. No development is required. Simply activate the Amazon and eBay integration and try it for free for a month. This integration is managed right within the Ecwid seller Control Pannel making it quick and easy to setup. Adding Ecwid to your WordPress site is as easy as installing the plugin and opening an account. The video above demonstrates how to in a couple minutes. Do you work with partners, bloggers and other businesses? Ecwid allows you to embed your store to any website, which means that with a simple piece of code, you can also add your store to your partner’s website, no matter what platform they are on! This is a completely unique feature to Ecwid. Embedding your store in partner sites is an excellent opportunity to tap right into your partner’s traffic by providing their relevant traffic with access to your products without leaving their site. If you would like to learn more about Google Shopping and Ecwid’s integration, check out the Podcast below. This integration is also available for WooCommerce but setup is seamless in Ecwid making it very easy for any non-techy user to connect their products to Google Shopping in a couple minutes. There should be no difference or redundancy between in-store and online inventory. In today’s age, there is no need for a developer to programs an online store that constantly needs to be updated when inventory is sold in-store. POS integrations allow seamless communication between a brick and mortar store and it’s virtual counterpart (your eCommerce site). Ecwid integrates with a couple POS solutions including Vend and Square. The only downside is that these integrations require an Unlimited plan starting at 99$ per month (which may be a bit high for smaller stores). WooCommerce is an excellent eCommerce platform for WordPress users with more technical knowledge. However, most non-techy users wind up with error messages and a great fear of having to carry out manual updates. 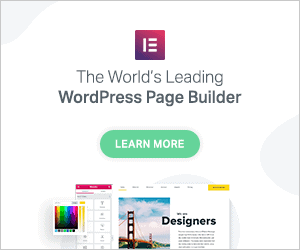 If you own a small business and want to get selling on multiple channels quickly, Ecwid is a solution you can easily integrate to your WordPress site. Ecwid allows you to seamlessly and simultaneously sell on multiple CMS platforms (ex. partner blogs), social media platforms such as Facebook and Instagram, and eCommerce platforms such as Amazon and eBay. With a user-friendly interface and their array of ready-available integrations, Ecwid practically eliminates the need for a web developer. In paid plans, the solution comes with live chat support and an eCommerce app to always be notified and on top of sales. However, Ecwid may be limited if you are a WordPress developer looking for an open-source solution for your clients. Ecwid offers development from their own team so marketers and small business owners can still obtain assistance if they have more complex requirements. By default Ecwid does not offer complex product options such as the ability to select options within product options. Ecwid may also become an expensive solution if you own a small business and need a POS integration as this requires an Unlimited plan that currently costs 99$/mo. Ecwid may also be limited for you if you would like to create complex customer groups and automatically associate various prices or rebates to each group as this is not possible in Ecwid for the moment. Ecwid does not offer extensive reporting by default so you will need to use a third party app such as Google Analytics to track sales more closely. It is easy to export and import products to Ecwid so if you sign up for a paid plan and change your mind in the future, you will not be locked in and will be able to export your product list in CSV format. Learn more about Ecwid compared to other eCommerce solutions, and how to set it up in only 10 minutes in this free webinar.